From a little girl watching cookie monster on TV and putting the butter cookie rings on my fingers and eating all around the edges, to the homemaker I am today baking for my family, I have always loved cookies. 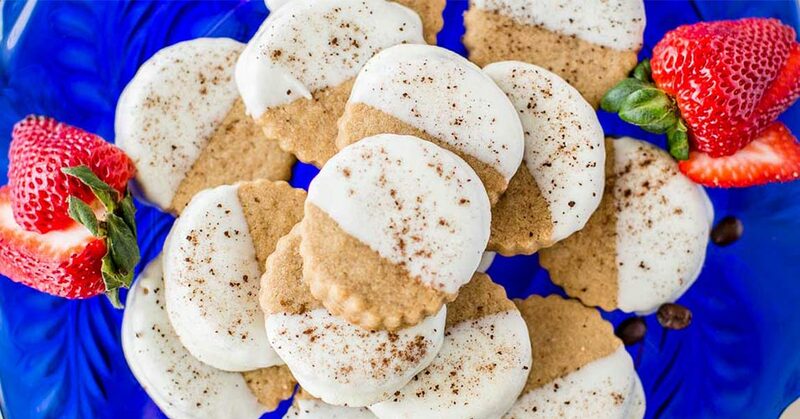 My Cappuccino Shortbread Cookies are just a grown-up version of those little butter cookies that we all ate as children, especially if you grew up in the south and went to Vacation Bible School in the summer! As with all shortbread, my cookies have a rich butter flavor with a hint of sweetness and the surprise taste of coffee. So, I decided to dip it in white chocolate and sprinkle it with instant coffee. This decision took this cookie right over the top, and now it has become a favorite! What a pretty cookie, and it tastes good too! So, who else loves cookies and what memories do certain flavors bring back to you? These not only taste amazing, but they’re beautiful!